With your concept taking shape, it’s time to get your stitch pattern down on paper (or rather pixels). This chart will be a key element in your calculations, and it’s essential for knitting your prototype. Of course it’s possible to design on the needles and write it down later, but that way often leads to wasted time and effort, as you may run into problems that could have been foreseen in the charting – and you’d be surprised how much you’ve forgotten by the time comes to write down what exactly you’ve done, and how hard it can be to reverse engineer your own work. For this reason, we recommend planning the entire project in detail before you start knitting. And that begins with the charts. Equally essential, of course, are the calculations for sizing and shaping your piece (and really, for writing the entire pattern, which we also encourage you to do upfront). But those are two large topics in their own right, so we’ll cover them later. For now, it’s all about charting – and one more thing: getting the most out of Ravelry. We keep harping on about how brilliant Rav is for designers, but it seems a lot of you aren’t yet at home there. So let’s fix that. There are several different resources for creating knitting charts, but the two main software options are Envisioknit and Stitchmastery. I use Stitchmastery rather than Envisioknit because it is available for a Mac operating system, but in discussions on the Designers forum on Ravelry there are lots of people recommending either. Both programmes allow for drawing charts, customisation and, crucially for me, automatically generating instructions to accompany the charts. That said, the main source of my loyalty to Stitchmastery is the excellent support available to users – there is a wonderfully informative blog and an active Ravelry group for any questions, and any time I’ve needed to email I have received a really quick an informative response (including things like, Help! I seem to have lost my activation key in a computer update). If your main concern is to have full control over the appearance of a chart, or crucially if you want to draw a crochet chart, then using a graphics programme such as Illustrator or InDesign is your best option. There is obviously a steep learning curve involved, and you will need to either use a knitting-specific font or create your own symbols for the different stitches, but this allows you full customisation of your graphics. To create charts using software that you already own, Excel (or Numbers) are also reasonable options, especially if you combine it with a knitting font for the various symbols (the one that I know of is available from Stitchmastery). To my mind the main drawback of both these options is that no written instructions are generated, and if you are making a large or complicated chart then creating those from scratch will take a significant amount of time. There are also several web-based options for generating charts, the most interesting of which is Stitchmaps. This allows you to see the shaping effect of the stitches you are using, as they are not constrained to a square grid – I often use it to check how things are going to line up after I have charted something in another programme, though I find the charts hard to knit from. Bear in mind that while you can draw a chart for free, a subscription is needed to export. More options are listed here. Create a full electronic chart for each stitch or colourwork pattern in your design (or if you don’t need a chart for your design, choose a pattern to chart and have a play!). Make sure that the chart clearly shows the repeat (by stitches and rows) and that every increase and decrease is accounted for. Play with the appearance of the chart – you can change the font and the size of the text, maybe rearrange the key. If you don’t have access to Stitchmastery, use another one of the programmes listed above to generate a chart. Make sure that the chart clearly shows the repeat (by stitches and rows) and that every increase and decrease is accounted for. That is, do the stitch counts work out? Does each row consume the correct number of stitches resulting from the previous row? If the stitch count changes from row to row, is that clearly shown? This is my (Robynn’s) Ravelry home page. It’s not the home page (what you’d see if you click on the icon, top left) – that would show you the Rav blog, with some helpful links for newbies; but I point my bookmark to the forums, and specifically to these groups, because these are the discussions I like to keep tabs on every time I check in. You might notice that none of them are the “Big 7” forums that every Raveller belongs to as default. Those are great, but I don’t need to watch them regularly (and honestly… because they’re so active, they can be pretty distracting). I belong to a large number of groups and I’ve arranged them in five different tabs, but these are the most important ones. Top left is the group I co-host with Emily, to discuss our designs. It’s not the most active, but it is friendly and most important, it’s a really useful space to announce new releases, run tests and so on. Then Designers and Budding Designers are the super-valuable groups we keep harping on about, and below I’ll show you some of the reasons why. The other groups you see there are useful for keeping an eye on new Rav developments and such, and below that (out of screenshot) I have some of my favourite social groups. Beyond that, you need to understand how your own patterns appear. I know that as a customer, I always check user projects (look along that row of tabs at the top) to see how the design looks in different yarns and on different bodies. So do what you can to boost those project numbers – test knitters are great for this. I also like to feature my favourite customer projects alongside my own photos (as I’ve done here), to highlight the pattern’s versatility, but many designers prefer to keep a tight rein on the page’s aesthetic by only using their own photos. There’s no one right way. Your designer page of course lists all your patterns, but it has some other nifty features. First, you can create bundles to help customers navigate those patterns. Second (and far more important to you as a new designer), it gives you a place to let customers get to know you – what’s your design philosophy? Where else can they find you online? Don’t neglect this space. Nor, for that matter, your personal Ravelry profile. It’s easy to forget to update your social links etc, but what a wasted opportunity. Every named designer of every pattern on Ravelry has a page like this – including those who only design for magazines or other publishers. Self-publishing designers also have Ravelry stores. The wiki has detailed guides on getting started as a designer, and setting up your store. There’s also a link to user activity, which shows every like, every queue, every comment or forum post about any of your designs. I love being able to see who’s talking about my stuff this way, but again, you have to go carefully: there’s a fine line between thanking someone for mentioning your work, and butting in unwanted. I always check carefully to see why the pattern came up and might say something like, “Hey thanks for the mention! Here’s another pattern that might suit your needs” – not punting one of my own designs, but offering a sincere contribution to the conversation. That usually gets a positive response, and gets me insight into what customers are looking for. If you aren’t already a regular Rav user, it’s time to explore. Find and join five groups (as well as Budding Designers and Designers!) that are relevant to your interests (whether personal or design-related). You don’t have to chat, but at least read a few threads. Oh, and need it be said, we’d love to welcome you to Miranda’s Lounge. 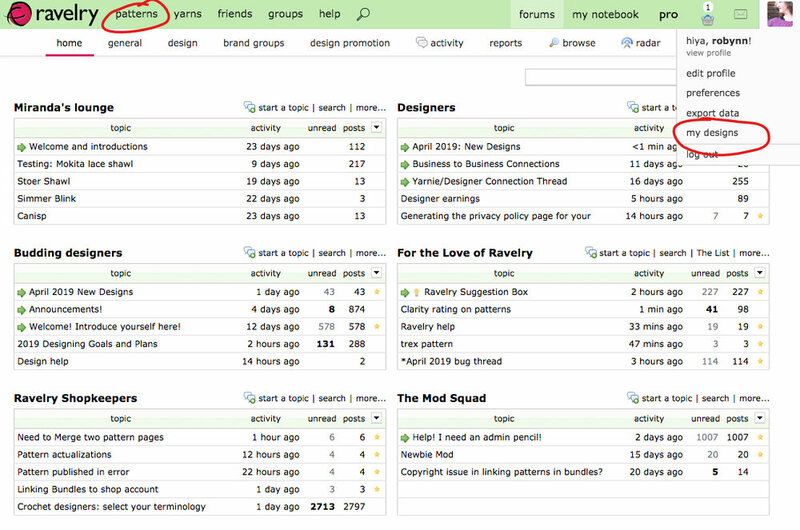 Organise your boards to put those new groups (and the designer groups!) at the top of your home forums tab. Check in on them every day for a week. Add your current projects. Link the yarn you’re using and note the needle size; such a helpful record, this is the main reason I start a project page for every single design I start noodling with. (I won’t make you add your stash. It’s super useful to do so – but for most of us that’s a major challenge in itself!) Oh, and if you’re knitting something from a pattern? Adding and linking projects is incredibly valuable for the designer. I’m just saying. They’ll love you for it. Do an advanced search for your current design concept. Use every filter to narrow it down as closely as you can to exactly what you’re making: the category, the shape, the fabric, the yarn. Interesting, no? So many patterns with the same criteria – but none of them are yours. There are plenty of ideas to go round.